Lucky Curve ladies pens similiar to the Duofolds but small. The Petite being even smaller. 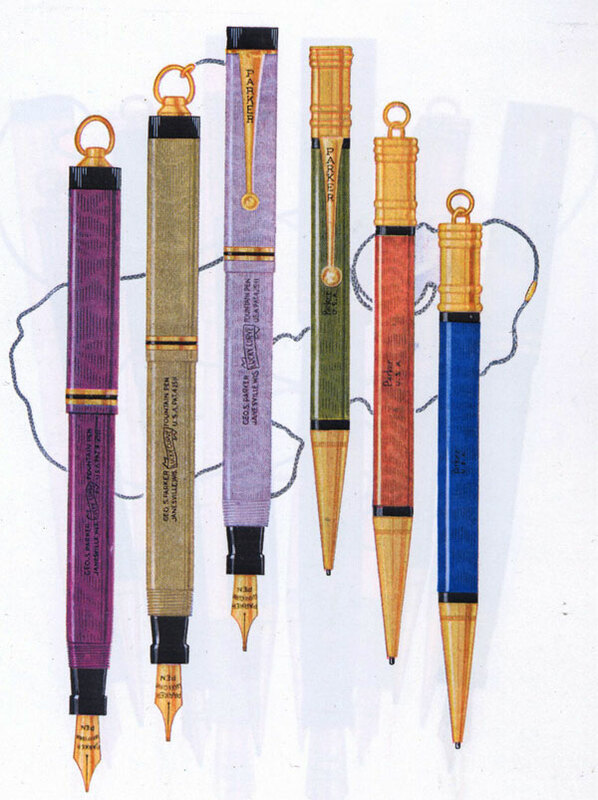 In early 1927 Parker introduced the attractive slender and small ladies line pen nicknamed the Pastel. They were ment as a ladies alternative to the rather dull black Parker DQ (Duofold quality) and the Raven Black, in the low price range. The Pastel sold for $3.50 for the pens and $3.00 for the pencils. The Pastel very quickly became rather popular, much because of the bright and happy colours they were produced in. The colours were of course a result of Parker abandoning the the old hard rubber for the new plastic, known as "permanite". The Pastel followed the Duofold in design, filling, mechanism, clip, attachment and general style. In short in every aspect, save size and colour. The first colours were: Magenta Mauve Naples blue Beige grey Coral They all had a black band between the two gold-filled cap bands. Within a few months a sixth colour was added, the Green. 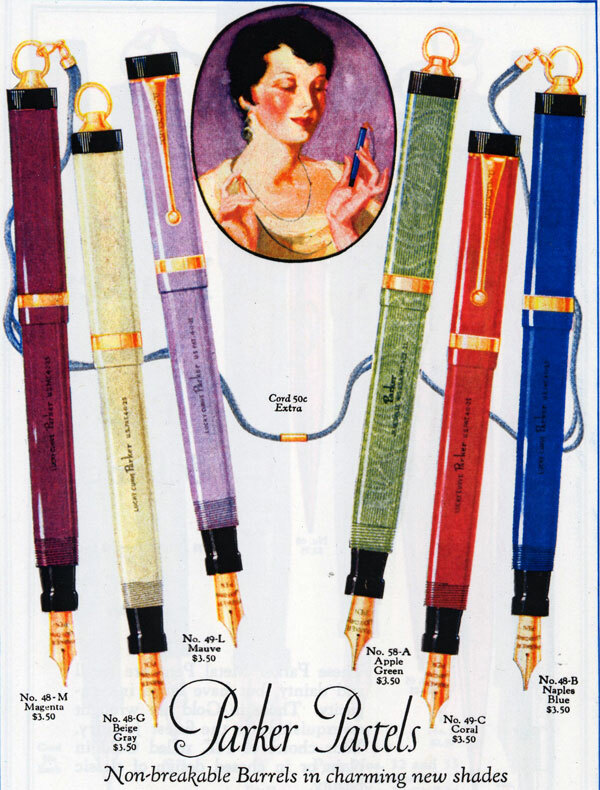 Contrary to other economy pens, Parker advertised the Pastel, mainly in women's magazines. he name, Pastel was, inspired by the colours: "6 alluring color combinations — with a new moiré pattern that women adore". Parker had enhanced the Pastel look by adding small stripes to the body and cap (on all colours save the blue) in a moiré pattern, only to be re-designed again a few months later, the body lines were now broken. he green shade was advertised as Apple green and the pencils now sported a black band on either side of the barrel, a feature later adopted by the Duofold pencils. 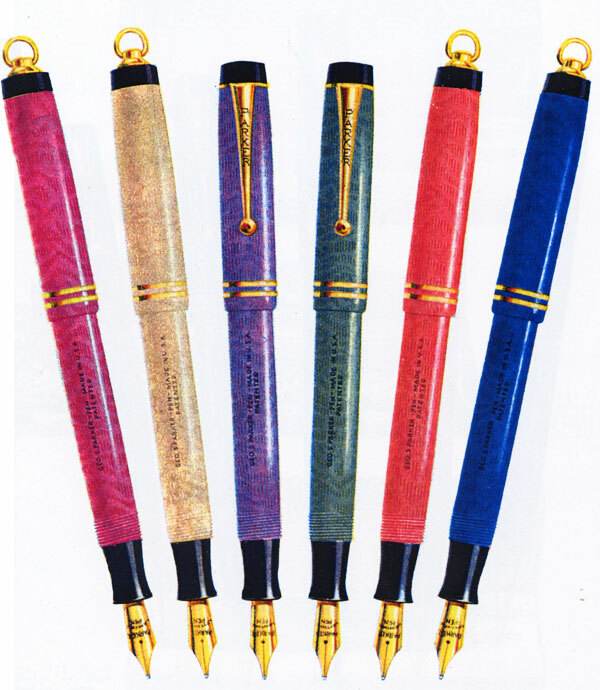 A trifle larger pen was also offered with a single cap band or two rings without the middle black band. The smaller black-lined (two-ringed) are often referred to as the Petit Pastels. In 1929 the complete line was re-designed and the pens became tapered at both ends, "streamlined", again following the re-design of the Duofold line. The Pastel were however phased out before the Duofolds, around 1931-1932. They are today quite popular among collectors on account of the bright colours, but since the bright plastic was easily discoloured and that they had to live in handbags with keys and steel brushes, have made them hard to come by in perfect condition.